Spring came late this year, but during the last two weeks we have seen an explosion of spring wildflowers in Columbia County, NY. This posting will highlight some of the common and not-so-common finds from our public spring flower walks, with particular attention to Violets and Trilliums. 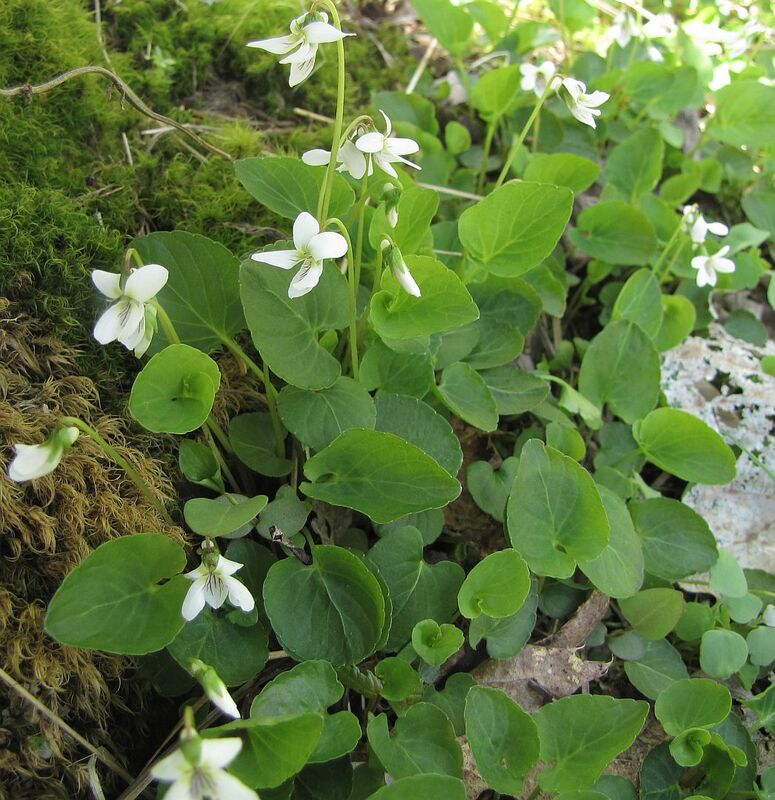 Right now is a fantastic time to be out there comparing all the different species of wild violets. Our most common violet is, surprise, surprise, the Common Blue Violet. It has relatively large, usually blue flowers and all its heart-shaped leaves are basal. This means, that the flower stalk has no leaves emerging from it above the ground. 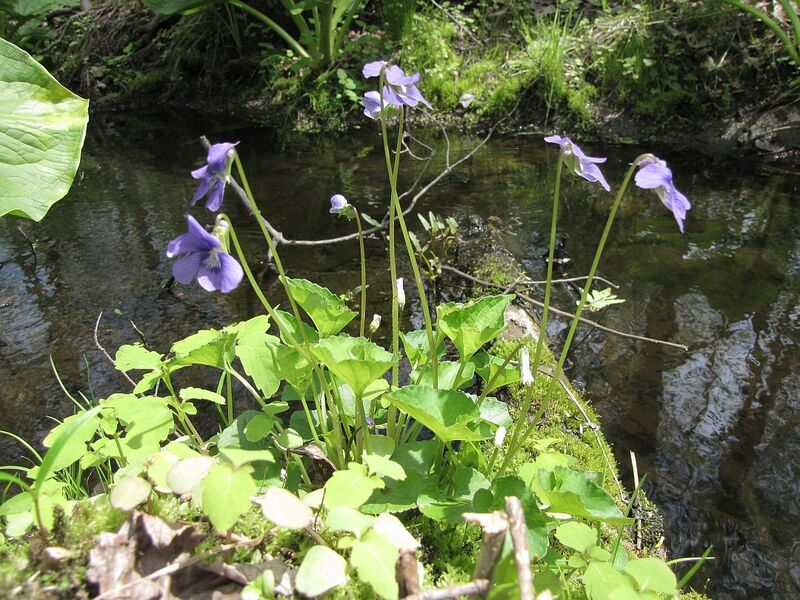 This characteristic places the Common Blue Violet in the group of “stemless” violets. 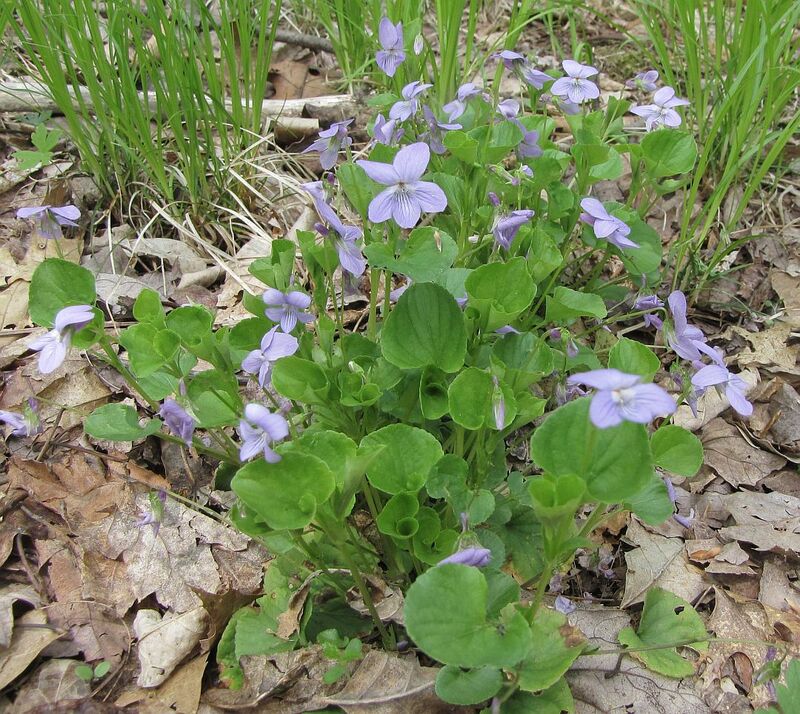 These violets are common on lawns and in meadows, but can also be found here and there along forest trails. The Common Blue Violet is not always entirely blue. 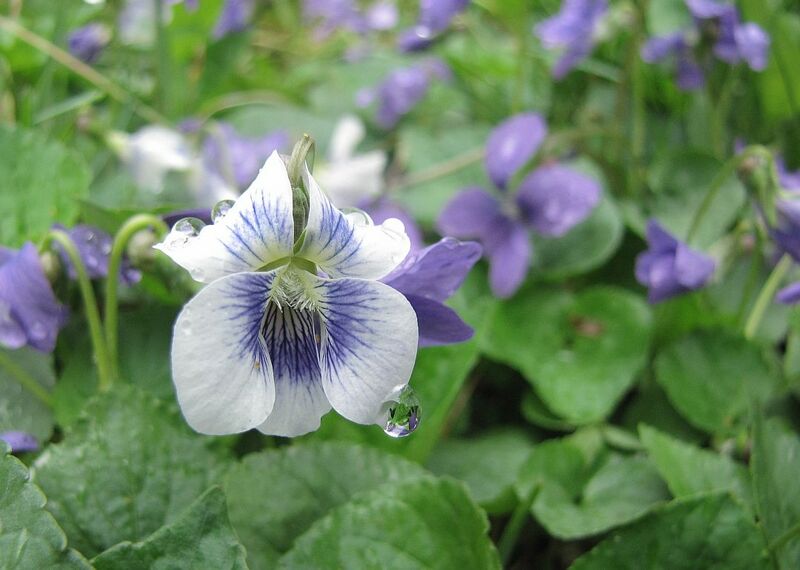 In fact, sometimes one finds them with bright white flowers (usually in lawns) or with the beautiful combination of white petals with a blue core, that is known as the Confederate Violet. Another “stemless” violet with large blue flowers is Marsh Violet. It usually grows near water and its flower stalks are markedly longer than those of the Common Blue Violet, raising the flowers way above the leaves. The opposite of the water-loving Marsh Violet is the Arrow-leaved Violet which tolerates very dry conditions and is found in dry, often sandy fields and on compacted forest roads. Its flowers are blue and its hairy, arrow-shaped leaves are all basally arranged, making this species another example of a “stemless” violet. 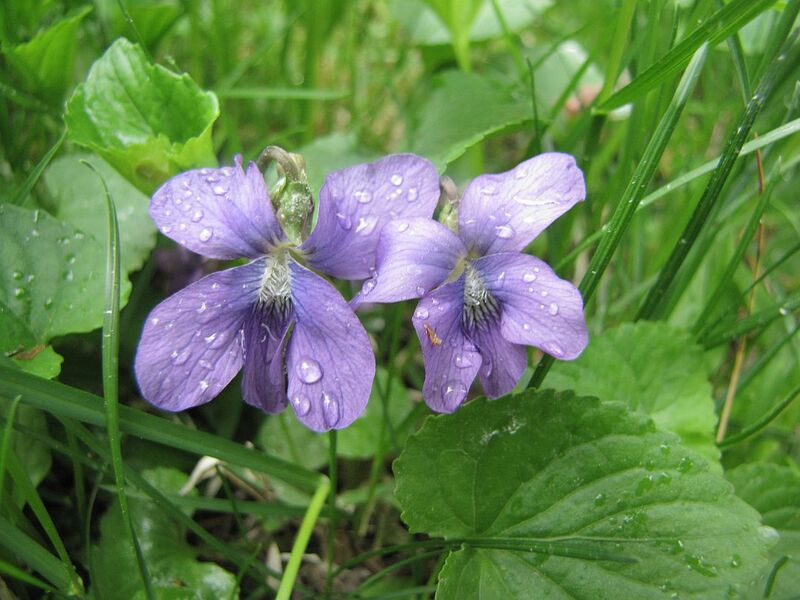 The next two species are examples of stemmed, blue-flowering violets. They tend to grow in bigger clusters and their leaves emerge from the same stalk as the flowers. American Dog Violet is the more common of the two in Columbia County and we found it during several of our spring flower walks this year, usually growing right along the trail in shaded areas. Its cousin is the Long-spur Violet, which often has slightly lighter blue-colored flowers and a very long “spur” protruding from the back of the flower. This species never grows on acidic soil and seems to be a good indicator for calcium in the substrate. 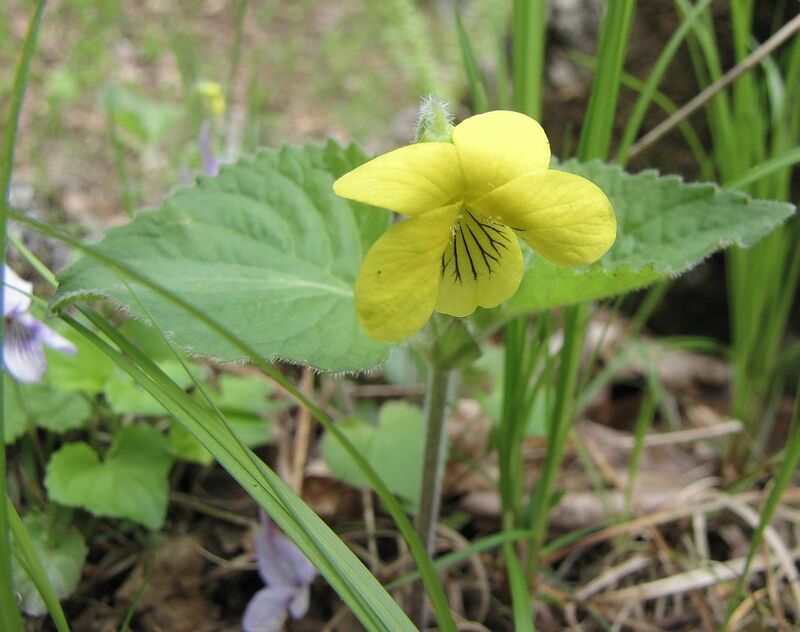 Our most common yellow-flowered violet is the Yellow Wood Violet. 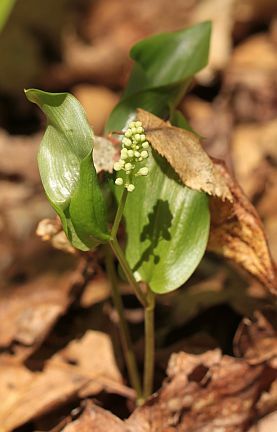 It is “stemmed” (i.e., leaves emerge from the same stalk that bears the flower, as clearly visible in the picture below) and is often somewhat pubescent (note the velvety fuzz along the stem and under the leaves). 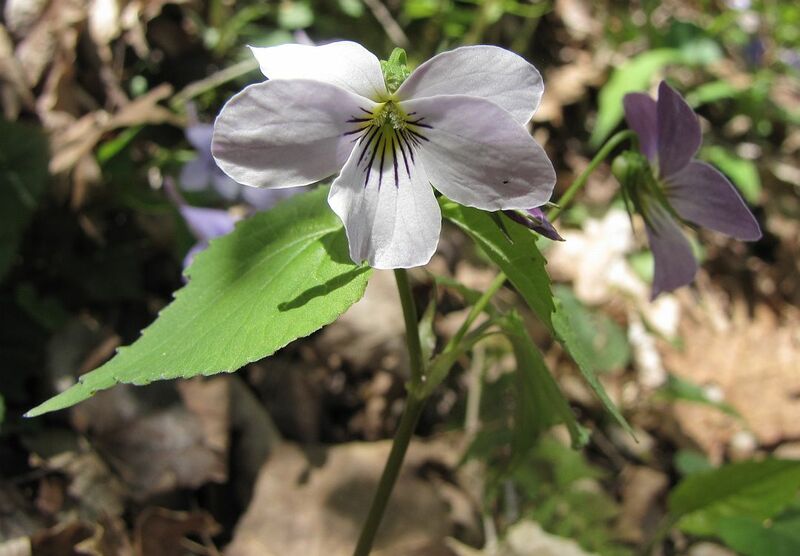 We saw the Yellow Wood Violet during several of our spring flower walks, always growing in shaded areas. 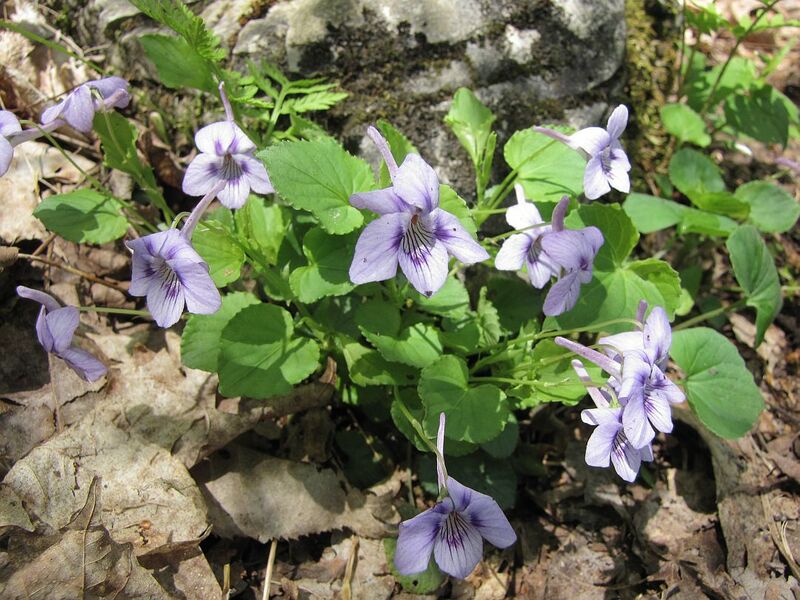 My favorite is the uncommon, limestone-loving Canada Violet. It grows tall and has many leaves emerge from its stalk. The flowers are white with purple lines in the front and the petals are purple on the back. 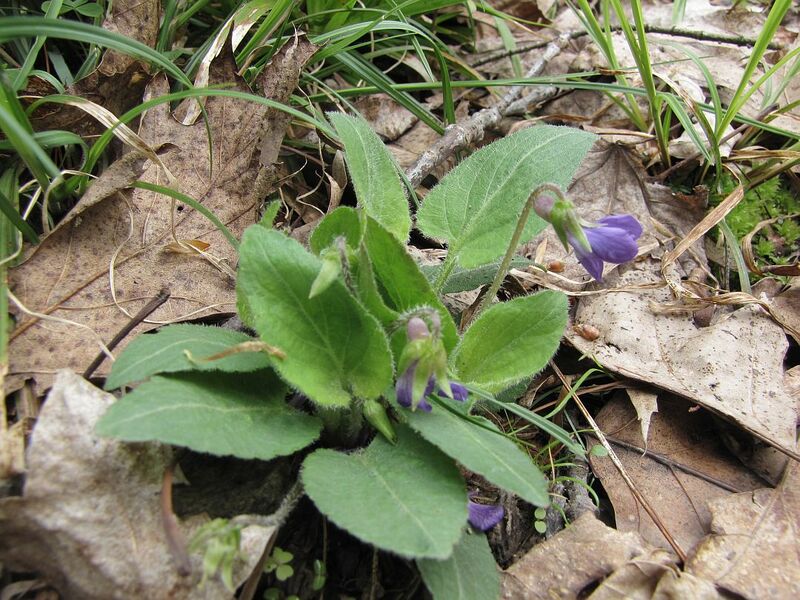 We know few patches of this lovely violet in Columbia County and all are close to limestone outcrops in the northeastern part of the county. Northern or Smooth White Violet is the smallest of our violets. Its leaves emerge all from the base, leaving the flower stalks bare. The leaves tend to be round-tipped and the flowers are less than 1/2 inch long, often only 1/4 inch. It always grows near water, besides brooks and springs, or along spongy lake shores. The Northern White Violet is sometimes hard to distinguish from the Sweet White Violet (Viola blanda) which grows in rich woods (rather than wet places) and tends to flower a couple of weeks later. We have not seen any Sweet White Violet in flower yet, this year, nor any the Palmate-leaved Violet (Viola subsinuata; fairly common woodland species, blue flowers, stemless). Two rarer violet species known to us from only a handful of places in the County and not yet seen this year, are Roundleaf Violet (Viola rotundifolia; yellow flowers, stemless) and Kidney-leaved White Violet (Viola renifolia; white flowers, stemless). The next group of species we’ll introduce are the Trilliums. 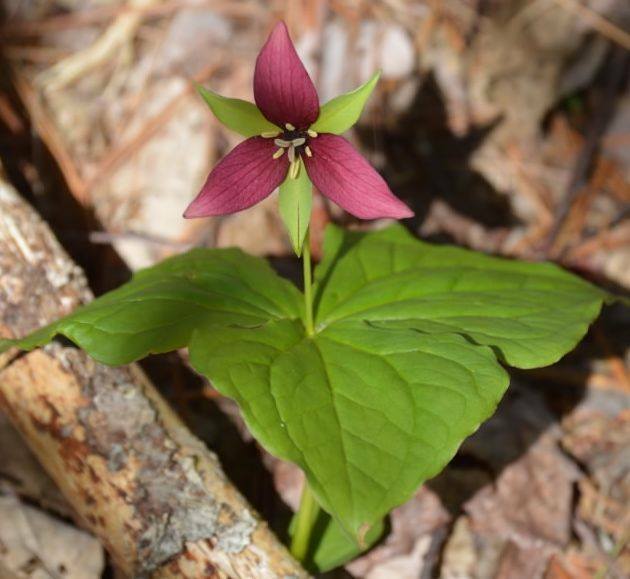 Our most common species of these gorgeous spring ephemerals is the Purple Trillium, which grows here and there in rich upland forests. Its characteristic, three-petalled flower tends to be displayed above the three leaves and is usually a deep maroon-reddish color. A few times we have seen white-flowering individuals of this species, always growing right next to its purple brothers and sisters. 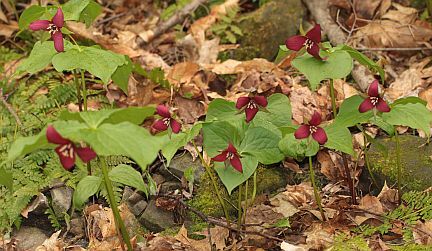 This spring, we were fortunate to have been shown a large dense patch of Purple Trillium on private land in North Chatham. Usually, we see these flowers growing singly or in small groups of two or three, often at the base of a tree. 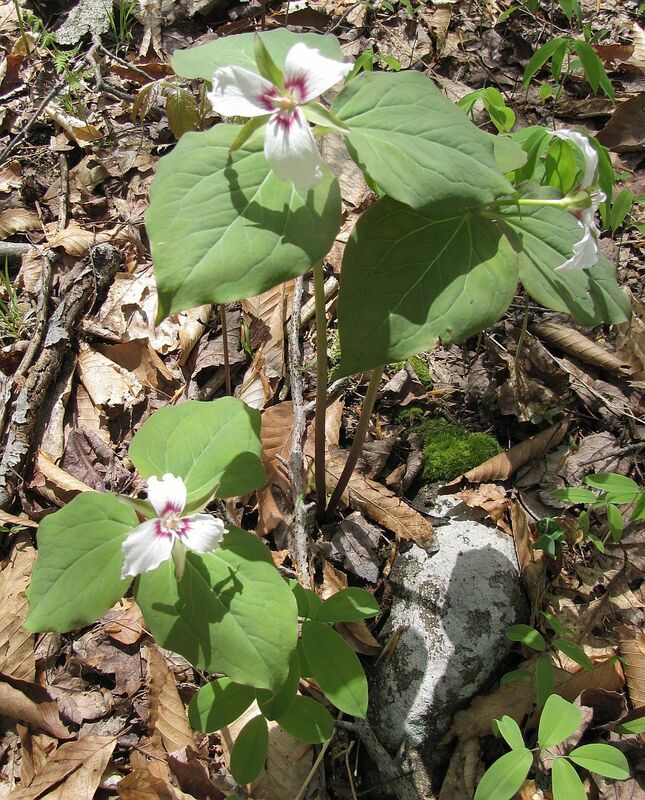 The white-flowering Trillium you are most likely to see in our County is the Painted Trillium, which also presents its flower above the three leaves and always has some pink marking at the base of its petals. This species is found more in the eastern part of the County in the higher elevation forests on acidic soil and we consider it uncommon in the County. We usually find it growing in small groups like this. An exciting find this spring was the state-wide rare Nodding Trillium discovered and subsequently shown to us by a friend at the Art Omi Sculpture Park. It was only the second time we have seen this species in the County. It seems to like moist woods. Its flower is bright white and is displayed UNDER the three leaves, hidden from sight by the casual passer-by. This is how the Nodding Trillium grows at the edge of a swamp forest. 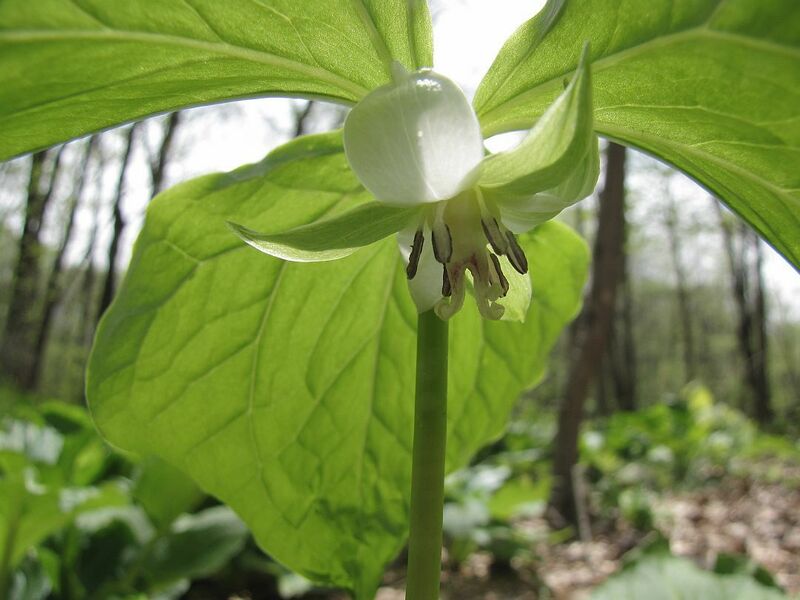 Should you know of any other locations where this rare Trillium grows wild in our county, please do let us know! 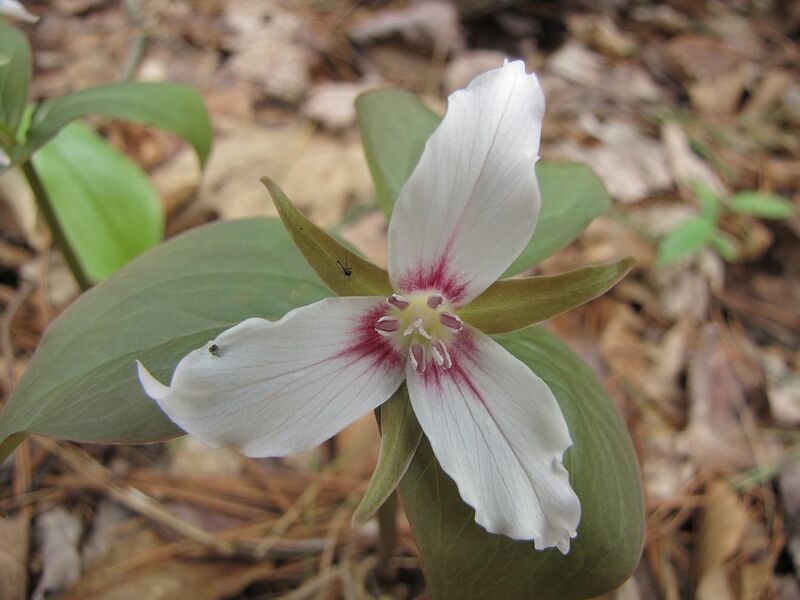 We have been sent pictures of a fourth species of Trillium, the Large-flowered Trillium (T. grandiflorum), which grows in a garden in Chatham, but has so far not been found in the wild in Columbia County. 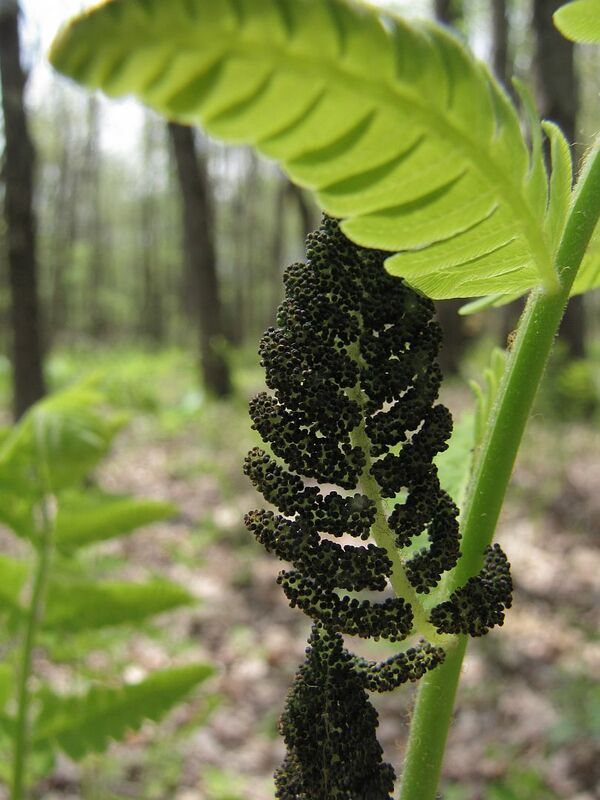 However, it is known to grow wild in rich woods in the Catskills and in neighboring Rensselaer County and it is worth to keep an eye open for it around here. Please let us know if you find one! We are always happy to find a nice patch of Dutchman’s Breeches, which we saw in bloom on three of our spring flower walks, this year. This uncommon species is closely related to the ornamental Bleeding Heart and displays its finely dissected leaves and uniquely-shaped flower as one of the first wild spring flowers each year. Does the flower look like a pair of white pants hung up to dry? 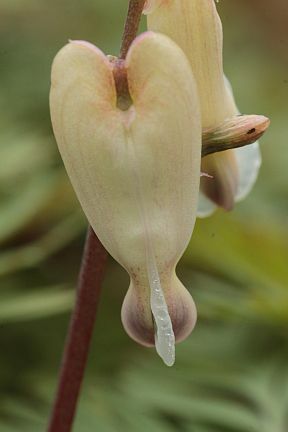 These heart-shaped flowers belong to a close relative of Dutchman’s Breeches, the Squirrel-Corn. During our first public spring flower walk this year in Lebanon Springs, we discovered the second location known to us in Columbia County, where this very uncommon species grows. 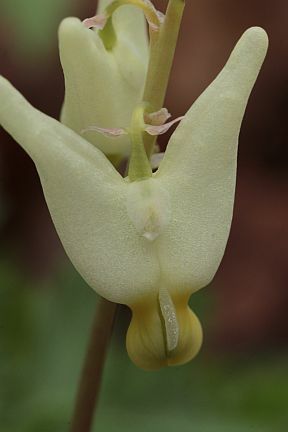 Its foliage is indistinguishable from that of Dutchman’s Breeches and they seem to like the same habitat. 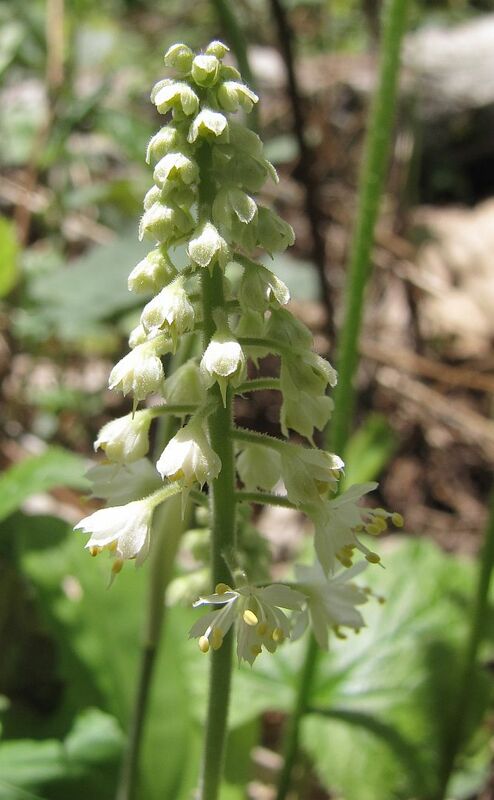 At both locations, Squirrel-Corn was growing interspersed amongst a large colony of Dutchman’s Breeches. 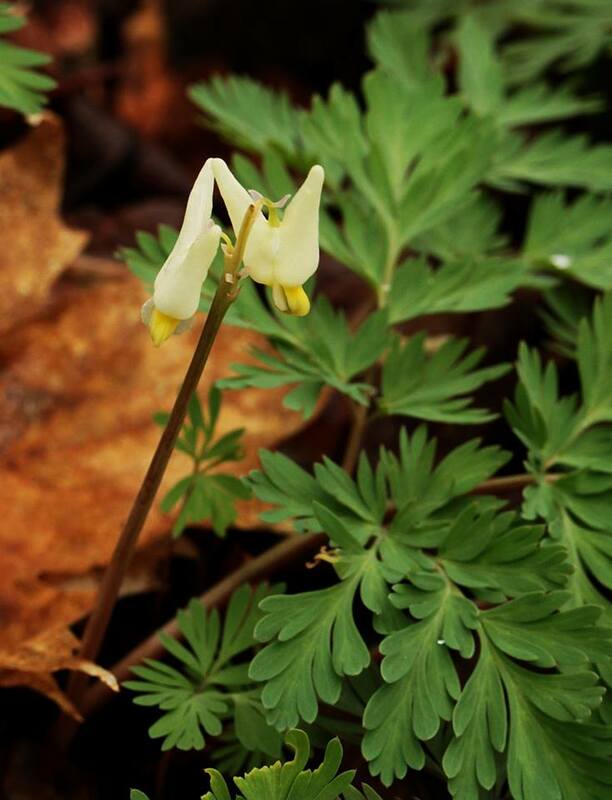 When in doubt, carefully expose some of the roots: those of Squirrel-Corn have round, bright yellow tubers that look like corn kernels, while the tubers of Dutchman’s Breeches are pointy and pinkish-white. 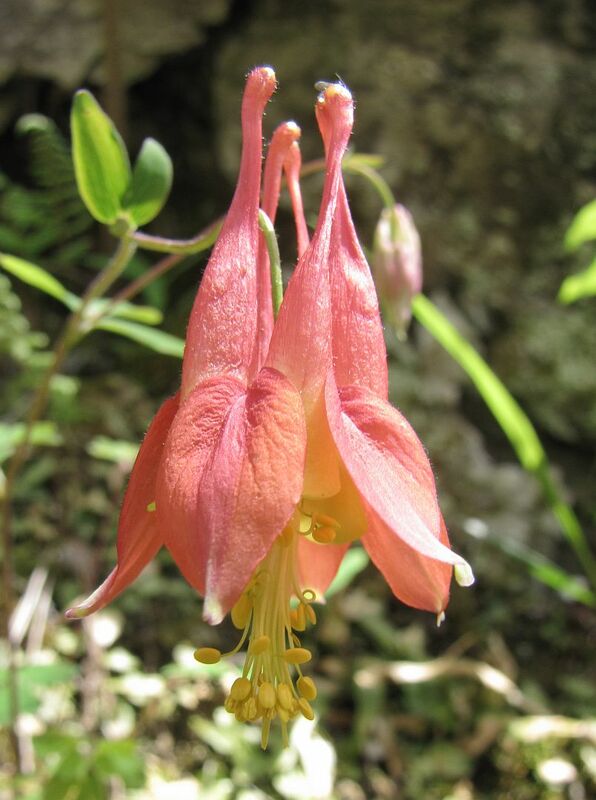 As I write this posting, our native plant garden around the Creekhouse is ablaze with Wild Columbine flowers, which are visited every day by hummingbirds. Wild Columbine also adorns many rocky road-cuts along the Taconic Parkway, and is found flowering from the shaly shores of the Hudson to the rocky summits of the Taconic Range. It is not a common plant but is found in the right habitat (on sunny rocky outcrops) throughout the entire county. The “big brother/sister” of Canada Mayflower is False Solomon’s Seal. It is a much bigger plant, with many alternating leaves along a single stalk which is terminated by a similar cluster of tiny flowers (these do play by the rules and have 6 petals each). The False Solomon’s Seal flowers are also not quite open yet. So, if there is a “False” Solomon’s Seal, how does the true Solomon’s Seal look like? 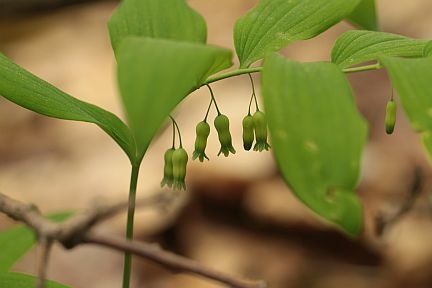 When there are no flowers or fruit, the two look awfully similar, but right now, the larger plants of Solomon’s Seal all have their bell-shaped flowers dangling from the leaf axils. 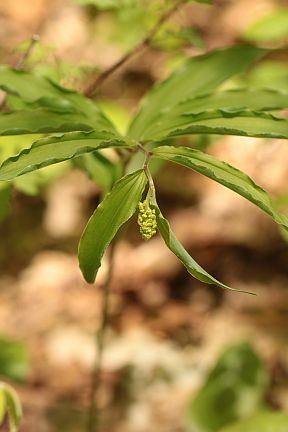 There are two species of “true” Solomon’s Seal in the County, the most common one (with slightly hairy leaf undersides) is pictured below. 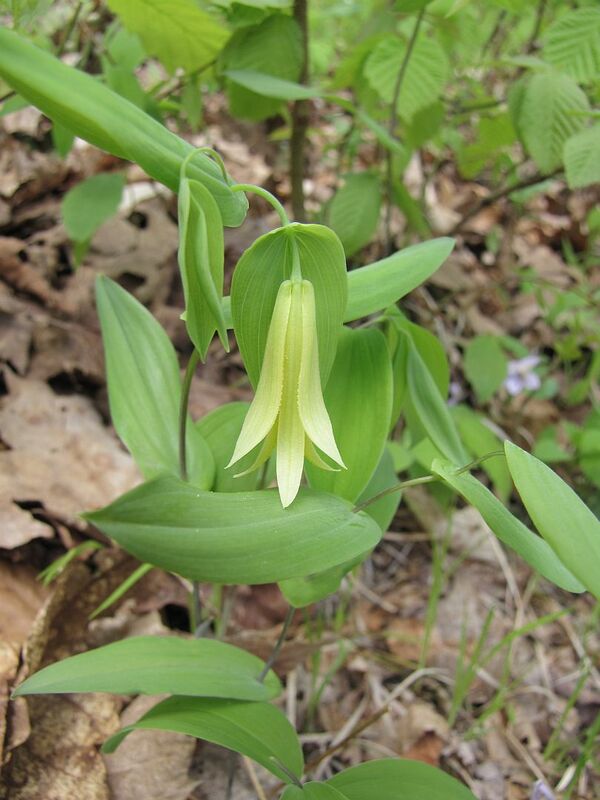 Another example of a spring-flowering member in the lily family is the Perfoliate Bellwort. Its leaves are very smooth and the stalk seems to grow right through the leaves. A single, large bell-shaped flower characterizes this species. It is always a treat to stumble across the brightly-colored and curiously-shaped flowers of Fringed Polygala or Gay-wing Milkwort. At first sight, it might be confused with an Orchid because of its unusual flower morphology. Upon closer inspection, the flower is composed of five sepals, two of which form the “wings” and three united petals, the lowest of which terminates in a fringe. It is a perennial with leaves that stay green through the winter (and look just like Wintergreen leaves, but don’t have the root-beer smell…). It tends to grow in dry, acid forests around here. And right now is its season to present its lovely, deep pink flowers to the world! Another delightful find awaited us in the floodplain of the Kinderhook Creek: Spring Beauty was flowering at the edge of the floodplain forest and an adjacent hayfield. This plant is also called “Fairy Sprouts”, because of its tiny edible starchy tubers. We don’t find this species very often and rarely in big enough colonies that would allow for a substantial harvest of tubers. 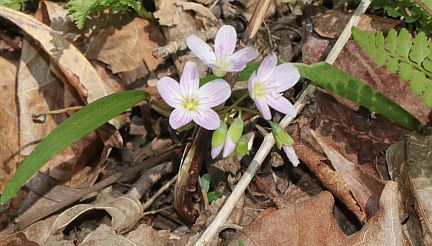 We just enjoyed looking at the delicate white flowers with their pink “nectar guides” and their many insect visitors that day… There are two species of Spring Beauty in the County – the one pictured is more common and has long, narrow leaves (vs. short, broad leaves of Claytonia caroliniana). 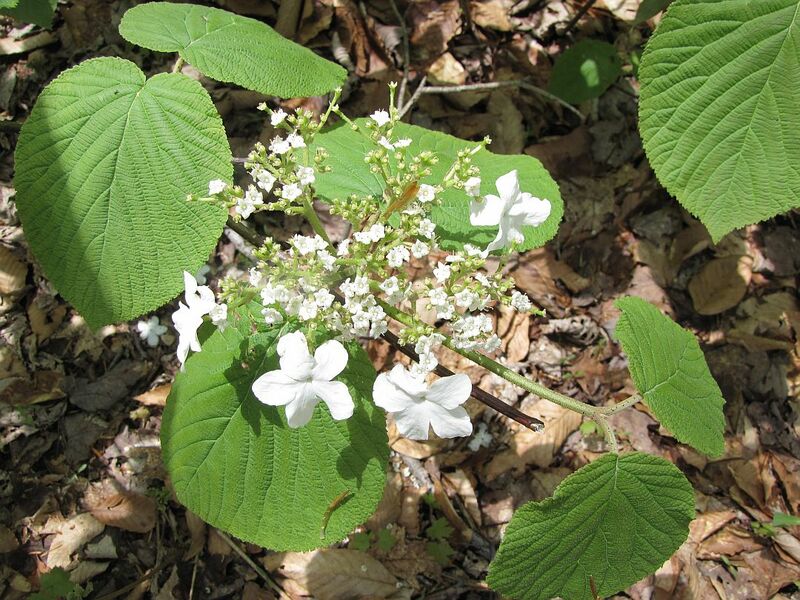 Foamflower is sometimes found in moist, shaded areas, often near rocks and in the vicinity of streams. 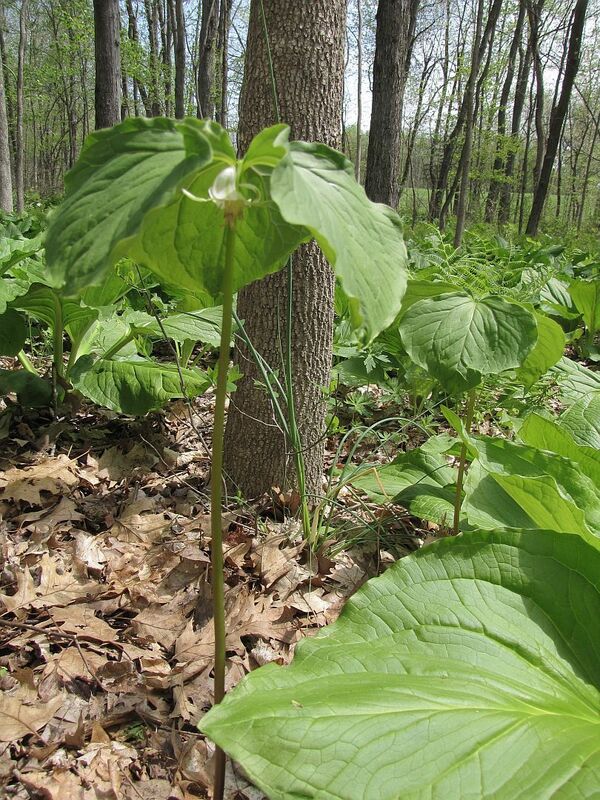 It has maple-shaped leaves that stay green in the winter and closely hug the ground. Right now, its star-shaped, 5-petalled flowers are in full bloom. 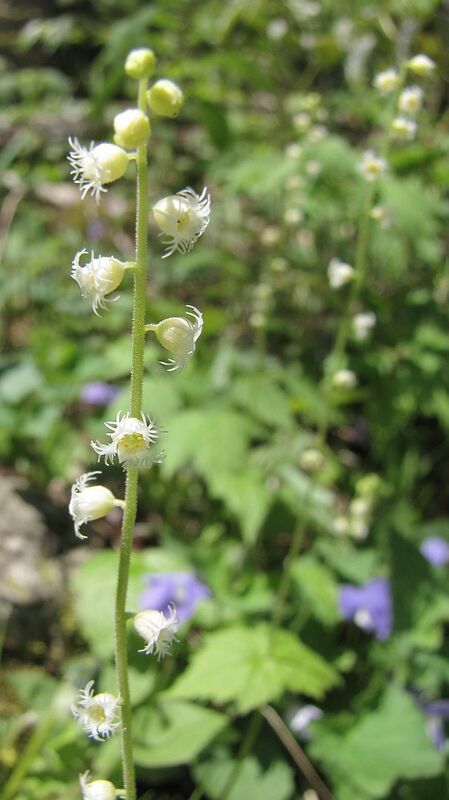 Miterwort has very similar leaves and tends to grow side by side with Foamflower. But its flowers are very different, sporting unique, feathery petals. In dry, open woodlands, along forest roads, and in dry meadows and lawns, the dainty Bluets or Quaker’s Ladies can be found flowering. This picture does not do them justice, because they really are more blue than white! 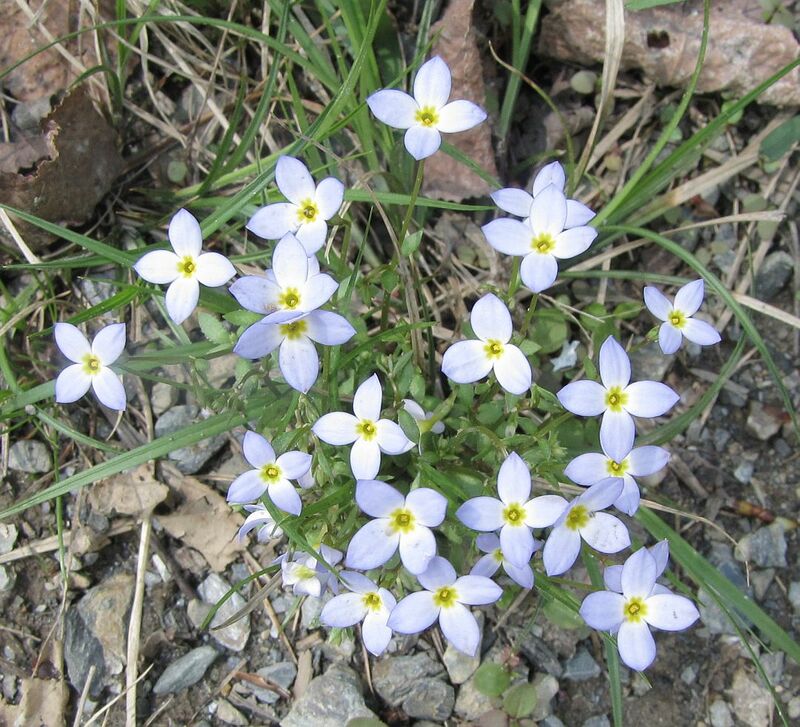 And don’t let the surrounding sedge leaves fool you: Bluets have tiny oval leaves at the base of the plant. A few woody plants drew our attention during the spring flower walks, as well. 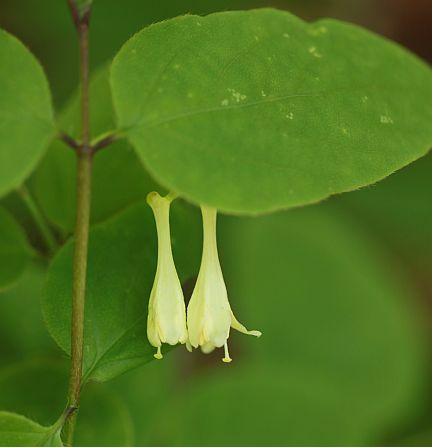 The American Fly-honeysuckle is a close relative of the invasive honeysuckle bushes which often dominate the shrub-layer of young forests. This native honeysuckle is a lot less aggressive, tending to stay in the shade of older forests, and growing smaller and more delicate bushes than the invasive species. Its flowers are pure white, tubular, with a shallowly lobed corolla. Its leaves resemble those of the invasive honeysuckles (Lonicera morrowii and L. bella), but these species have flowers with deeply loped corollas and often a pinkish tinge. However, all Lonicera species have paired flowers which will produce paired seeds. Go check it out on the nearest invasive honeysuckle! 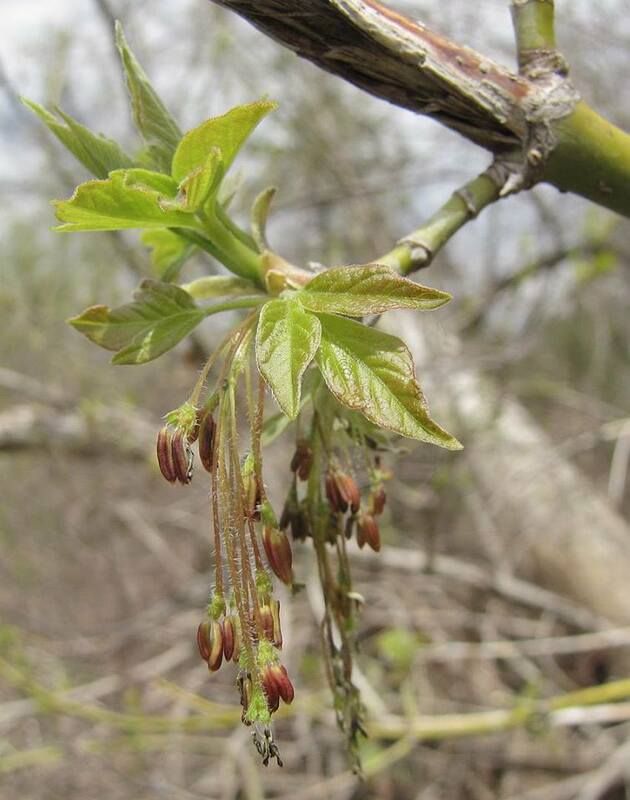 In our last blog, we spoke about maple flowers and how different maple species have different arrangements of the pollen and seed-producing parts in their flowers. Below, you see the perfect flowers of Striped Maple, where each flower contains both, the seed-producing and pollen-bearing parts. In contrast, meet Ms. and Mr. Boxelder! 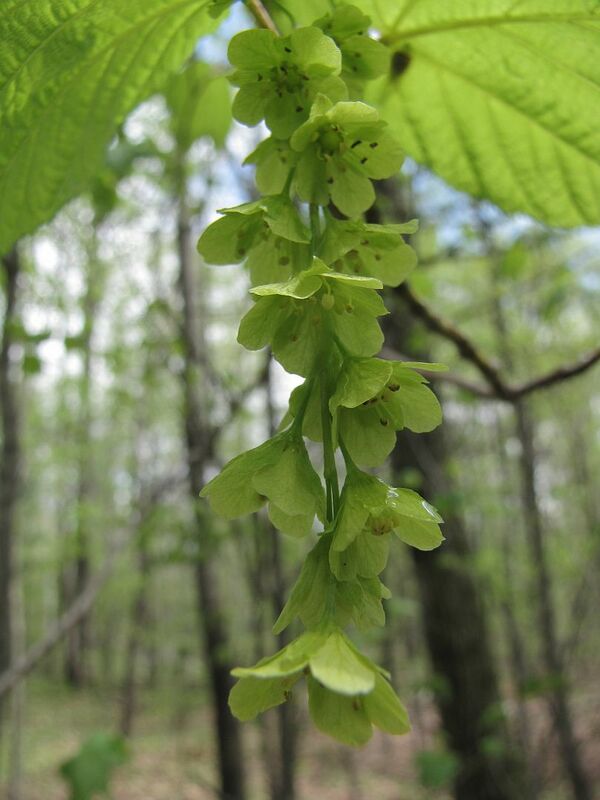 This species, which is easily recognized as a maple by its tiny maple fruits (‘keys”), has seed-bearing flowers and pollen-bearing flowers on separate trees. Therefore, you can speak of male and female Boxelder individuals. 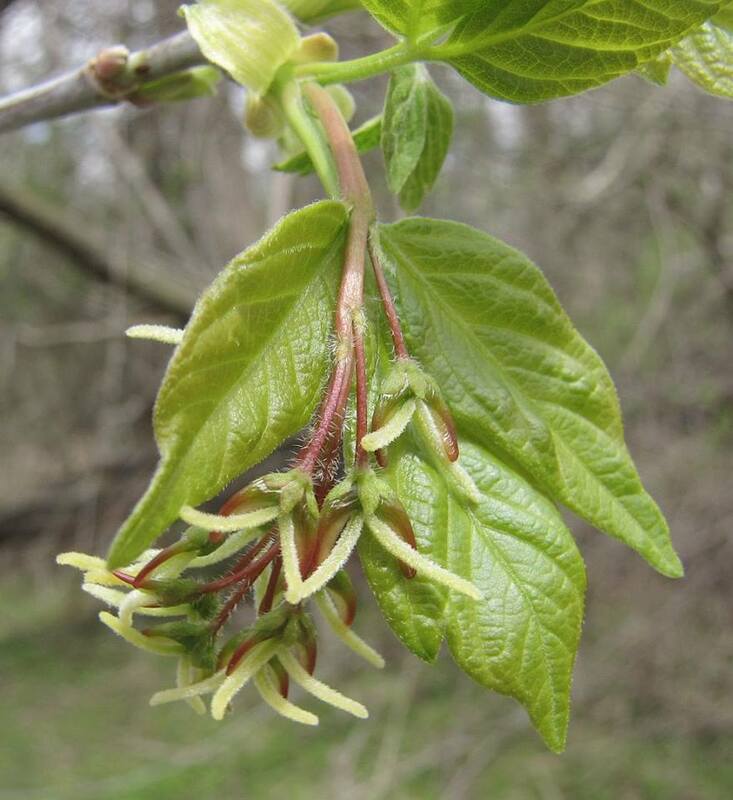 Below is an image of the female flowers of Boxelder, which display a large two-parted stigma out to catch pollen. The male Boxelder flowers are reduced to pollen-bearing anthers. The red ones in the image below still contain pollen. The anthers that have already shed their pollen are still recognizable as dried-up remnants. Finally, not all plants produce flowers and seeds. Ferns are examples of plants that reproduce by spores. Some ferns produce their spores on the leaf undersides, such as Woodferns, Ladyfern, Hay-scented Fern, and Bracken Fern. Some grow separate “sporophylls” (spore-bearing leaves), such as Ostrich Fern, Cinnamon Fern, and Sensitive Fern. And finally, there is Interrupted Fern, which goes the middle road: on reproductive fern fronds, a few “pinnae” (=leaflets) are dedicated to spore production rather than photosynthesis. The entire leaflet grows spores and once they have dispersed by mid summer, those pinnae dry up and fall off, leaving interruptions in the fern frond, hence the name Interrupted Fern. More on spring wildflowers (including images of many species not pictured in today’s posting) can be found in our postings of 12 April 2011 and 1 April 2012. 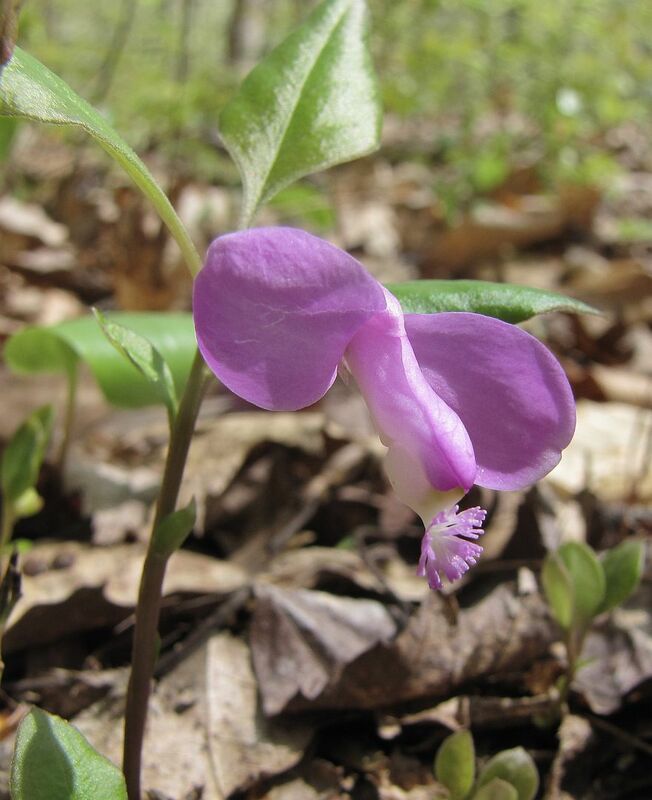 If you live in or frequently visit Columbia County and are interested in receiving announcements for our free public spring flower and other ecology walks throughout the seasons, please sign up here.